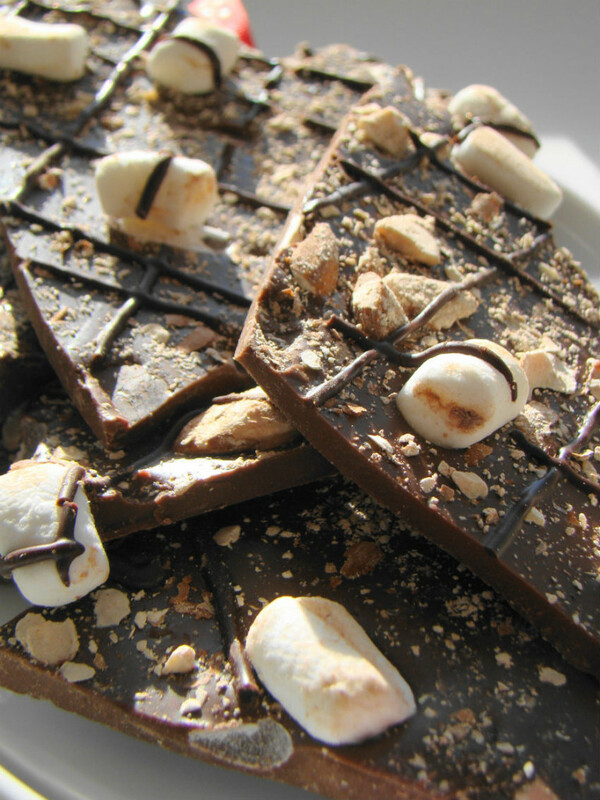 Dark, Milk and White Chocolate Almond Bark. At Holiday time, everyone is rushed and time is one thing that everyone doesn’t seem to have enough of! Having said that, I love recipes that are easy, look real nice, are flavorful! It’s a bonus when it doesn’t take up too much of that precious time, and still lets your friends and family know that you care about them! This recipe fits all those categories to a “T”! The other nice thing about it, is that with a little ingenuity, this recipe can be changed up without too much fuss. The ingredients are easy to find, and adjustments to the amounts will not result in a recipe that didn’t come out quite right. It will always come out right! I like to call this one “fool-proof”, after all if I can make it, anyone can. Remove from the oven and set aside so that they will cool. If all the chocolate has not melted in that time, pour out the melted chocolate and reset the microwave for another minute. TIP: It is better to microwave smaller batches of chocolate, than to burn by microwaving for a longer time. On a parchment or wax paper lined cookie sheet, place the almonds on the sheet and then start to pour the chocolate on top. TIP: Ideally this should be about ¼ inch thick, but you can make it thicker if you like. Once this is done, place the cookie sheets into the refrigerator, on a flat surface to cool and harden. When this is completely cold, remove from the refrigerator and break into pieces. Keep these in a covered jar or candy dish, in a cool place. OPTIONS: If you have decided to add something other than almonds, you can do this too. You don't need to bake any of the other items that I mentioned in the recipe, so making this will be even easier. You can also do almonds and some of the other ingredients, it is entirely up to you. You can make this real special looking by starting with milk or dark chocolate and then when you have poured that chocolate onto the almonds, do a second batch of white chocolate and once melted, add that to what you have already prepared. Your Almond Bark will come out looking like chocolate on one side and white chocolate on the other. Alternatively you can add the second layer of other chocolate and draw a knife through both layers of melted chocolate, and it will come out looking like a marbled effect! I guarantee that once you bring this to one party, everyone will ask you to make some for their party too! You can never have too many quality cookie sheets, they are so versatile to use. For all your baking and non-baking needs! These silicon mats are economical and very “green” even though they are red. Reduce, reuse and recycle, even when you are thinking of holiday baking and treats. Add this dish and make it a really special hostess gift, filled with your signature Almond Bark. May your Holidays be Merry and May you Friends be Many!